New owners of Cherry Lanes Barcade Erin and Kevin Bosman with their daughter, shortly after purchasing the business in January. Submitted. Erin Bosman said her husband has had “this pinball thing” for a long time. Now, his “thing” has become their business. Kevin and Erin Bosman bought the Cherry Lanes property on Fourth Avenue in Sturgeon Bay on Jan. 3, and immediately closed the business to remodel. They hope to re-open in March as Cherry Lanes Arcade Bar, with an all-new feel to the establishment that opened its doors in 1929. Kevin has long had a passion for pinball, seeking out arcades and barcades wherever the family has traveled. Arcade Bars have been trendy in cities like Chicago, New York, Minneapolis and Portland for several years. Kevin’s personal collection of five pinball and four arcade machines will now migrate from the family barn to Cherry Lanes, with more to come. It already has three pool tables, dart machines and a foosball table. It won’t be the first time the couple have re-imagined a historic building. They’ve owned Patricia Shoppe in Egg Harbor since 2001, housed in what was once the Egg Harbor Village Hall. This project will include refinishing the eight vintage maple bowling lanes, updating the bar decor, and adding an arcade vibe to the space. They also expose the original terrazzo flooring and brick walls long hidden by wood paneling. 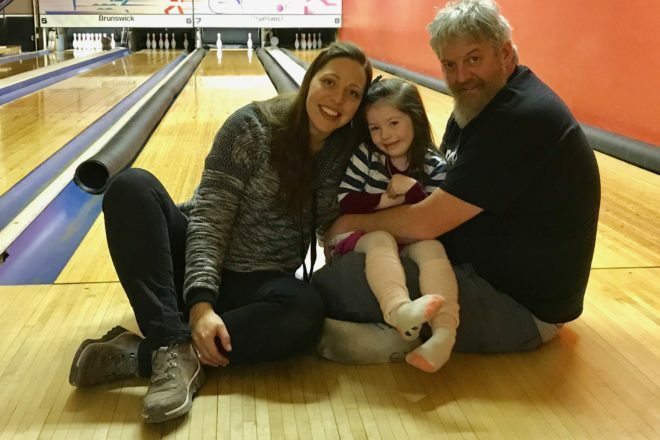 Kevin is a lifelong resident of Sturgeon Bay who was employed by Palmer Johnson until the yacht builder closed in 2015, while Erin is a Baileys Harbor native whose family is tied to another classic bowling alley, the Sister Bay Bowl. Despite the connection, the bar business will be something new for both of them. Food will be limited to pizza, popcorn, hot dogs and snacks. They hope to add a soda fountain and soft serve machine eventually. After 10 pm the crowd will be limited to ages 21 and older. The Bosmans have dreams of reopening the 4,000-square-foot dance hall upstairs too, but that will come down the road. In the meantime they are seeking out more information about the history of the building. They’ve discovered that it was designed by Fred Crandall for Anton Paul and opened as The Congress Recreation Parlors Nov. 15, 1929, as a bowling alley and dance hall. They recently discovered the builder was actually Erin’s great-great-uncle John Anschutz. 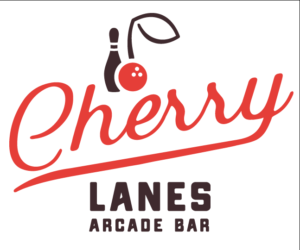 Editor’s note: This article has been updated to reflect a name change from Cherry Lanes Barcade to Cherry Lanes Arcade Bar. The Barcade name is trademarked by Barcade Inc., which launched its first location in Brooklyn, New York in 2004.